Just about the first hybrid I ever created (and the first one I registered) is Sinningia 'Peninsula Belle', which is Sinningia lineata x Sinningia reitzii. 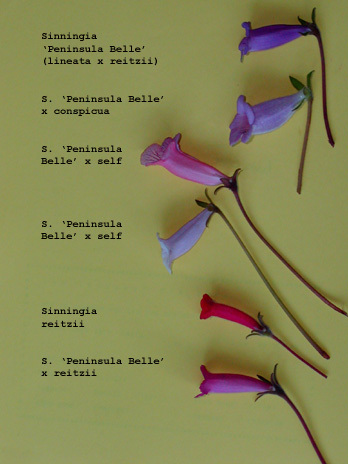 I have done crosses with S. 'Peninsula Belle' also, and some of them are pictured to the left. One obvious difference among the flowers is the angle between the stem and the corolla. In S. reitzii, the angle is almost 180 degrees. In S. lineata (not shown), the angle is close to that. But in S. 'Peninsula Belle', the angle is closer to 90 degrees, making the flowers look "slipper"-like, even though they have a straight tube. The two flowers from the selfings have completely different angles, one close to 180, the other close to 90. Length of pedicel is another obvious difference, with the two selfings having the longest. I don't know where that came from. One characteristic the flowers have in common is the flaring calyx lobes. 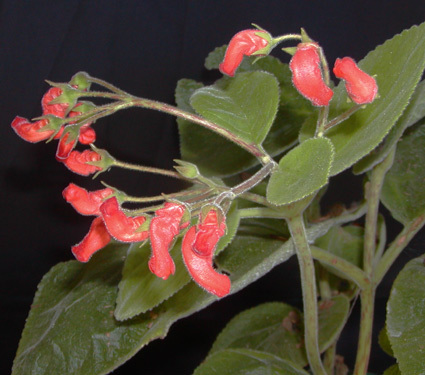 That appears to be entirely from S. reitzii, since S. lineata's calyx lobes clasp the corolla tube, as can be seen on the Sinningia lineata page. One trait that doesn't show in the picture is time from seed to flowering. It was about 5 years for S. 'Peninsula Belle', and 4-6 years for most of the selfings -- one took 10 years! Other people have mentioned this as a trait of lineata hybrids, and I can believe it. By contrast, Sinningia 'Peninsula Belle' x conspicua bloomed the second year from seed (which for me is really really fast). One plant I got by selfing Sinningia 'Peninsula Belle' strongly resembled its S. lineata grandparent. This was the one which took ten years to bloom. The resemblance was the only reason I hung onto it -- I wanted to see the flowers! Unfortunately, the flowers, while lineata red-orange, were malformed, and have never opened. In the privacy of my own yard, I call this plant Sinningia 'Three Mile Island'. Note the lineata-like peduncles and the lineata-like red streaks on the stems. This picture was taken August 2008. I back-crossed S. 'Peninsula Belle' to S. reitzii, hoping to get more red. 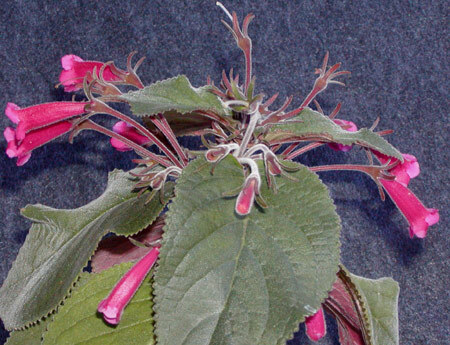 The resulting flowers were larger than those of S. reitzii and intermediate in color between S. reitzii and 'Peninsula Belle'. 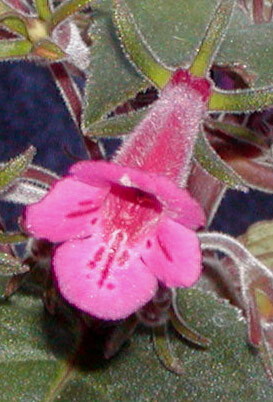 It is more floriferous than S. reitzii (under my conditions), and the plant is more compact.